Finding Follows – Slices is the only Twitter app with Explore. 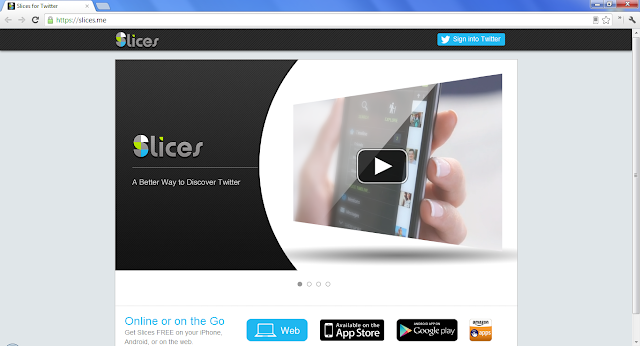 Explore is a directory of all of Twitter. With 21 browsable, searchable categories, finding people and lists to follow is astonishingly easy and fun. Live Events – Only Slices has Live Event streams, finally making it easy to follow live events on Twitter. Each stream displays a feed of tweets from the “right” people for today’s events, like sports, TV shows, and other happenings. Timeline Slicer – Another exclusive feature, the Timeline Slicer helps you organize your timeline into “Slices”. These are mini-feeds that you define, letting you read what you want, when you want it. Bookmarks – Anyone who browses the web is familiar with the Bookmark concept. But Slices is the first Twitter app with bookmarks. Just like on a web browser, you can bookmark favorite Twitter accounts or lists for easy access. Mobile-to-Web – Slices lives on your iPhone AND the Slices website. All your actions are automatically synchronized. No struggle to find where you left off, or notifications of messages/mentions that you have already seen.